Depending on how you look at it, the Circle of Fifths can be either very useful or simply something that other people like to talk about. Let’s take a look at its useful purposes – otherwise this would be an even shorter mini-lesson than normal! 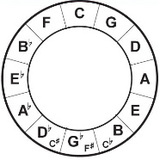 To create a Circle of Fifths for you to examine, draw a circle. Then mark the circle off at twelve points, just like a clock. Put “C” at the 12 o’clock position. Now think about the C Major scale. As you probably know from reading any of our articles where the Major scale turns up, the notes of the C Major scale are C, D, E, F, G, A, B and then C again. The fifth note of the C Major scale is G, so let’s put G in the 1 o’clock of our circle. Notice that when we get to the bottom of the circle we have a few options as to what to call the notes in the 5, 6 and 7 o’clock positions. Usually at 6 o’clock we switch from F# to Gb, for reasons that will hopefully became clear in a moment or two. Just accept this for now, okay? Usually when writing out music, we tend to stop at six accidentals. It’s not only hard to keep track of more, but it’s also a royal pain to write out in notation. This is why the F#/Gb is usually a change-over point, if you will, in the Circle of Fifths. So you can already see one use for the Circle of Fifths – it’s a handy method of remembering key signatures in terms of the numbers of flats or sharps in any given key. Not that that’s all that hard to remember in the first place, but it is handy to use it as a spot check. This riff, while based on the C minor pentatonic scale, contains notes that are not in that scale. But it’s still cool, so wouldn’t it be smart to be able to play it in another key, say A or even Eb, so that you could use it whenever the mood of the song felt right and not whenever both the mood of the song was right and you happened to be playing in the key that you know the riff in? And you would go on and on through each of the twelve keys until you got back to C again. Practicing in this manner helps you to get comfortable and confident moving about the fretboard. And if you’re smart enough to be keeping track of the notes you’re playing, it also helps you know where the various notes are at different positions on the neck of your guitar. But it’s when you develop a relatively good grasp of the Circle of Fifths that it can actually help you most. Suppose you’re jamming along with someone, playing a song you’ve never heard before and all you know is that it’s in the key of C. You’re already up on your knowledge of diatonic chords so you’ve got a good idea of what chords you’re most likely to run into. And then out of nowhere the song goes to, say, an E or E7 chord. Normally this might throw you into a total panic attack! But you know your Circle of Fifths and you know that E is the fifth of A. It’s also the fifth of Am, too. So you can reasonably expect that the next chord following will very likely be Am (returning back to the chords of the key of C) or A (or A7). Not always, but more often than you might think!. If you go on to A or A7, guess what the next chord is very likely to be? If you guessed Dm or D (or D7) because you know that A is the fifth of D, give yourself a bit pat on the back. Being able to make a fairly substantial educated guess about where a chord progression is heading will help make you a better all-around player, whether you play leads or just chug out the rhythm. I love the idea of using this information to make educated guesses about chords when learning by ear! I do this all the time with my students, especially when we explore non-diatonic chords. If a chord sounds like an “oddball”, I ask them to envision it as the 5 chord of the next one in line. Many times it works and you’ve got an instant secondary dominant lesson! I remember when I started recognising the sound of chords moving in fifths it made such a huge difference to my aural skills. I started hearing it everywhere and realising just how often one chord moves around the circle of fifths to the next one. Assuming that a chord is going to move that way is a great way to start listening out for it!